I’d been thinking about footswitches for a while, but I held off on buying one because they were expensive. Turns out that building your own is easy, even for someone with limited electronics experience. I do have the unfair advantage of having a spouse who’s an electrical engineer, but I figured out this circuit and code by myself! After you upload the code to the Arduino, you’ll also need to reflash the ATMega8U2 chip so that it can act like a USB keyboard. 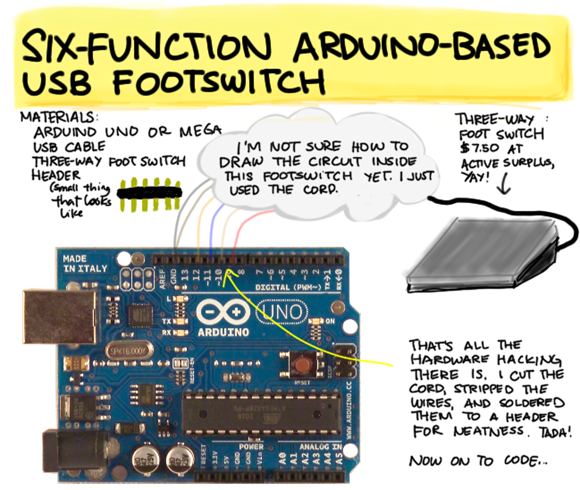 This sounds scary, but the instructions on the Arduino site can help you. When you’ve gotten the hang of reflashing the ATMega8U2 with the standard firmware, reflash it with the Arduino-keyboard-0.3.hex (Uno) or Arduino-keyboard-0.3-mega2560.hex (Mega) firmware from Arduino Hacking. 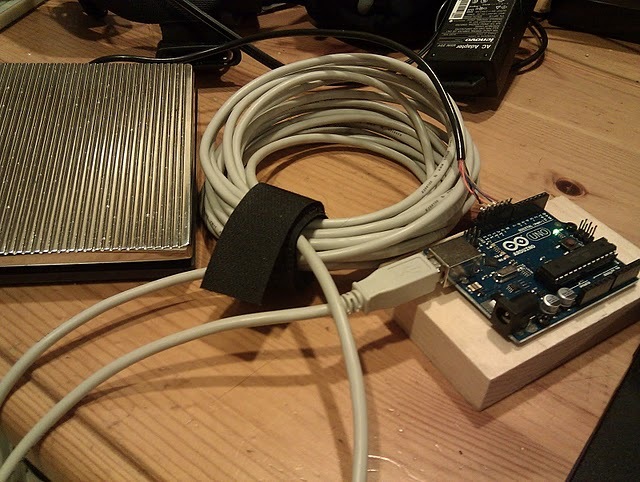 After you reflash, unplug, and re-plug your Arduino, it should now appear as a keyboard. If you made a mistake, don’t panic. Just reflash the standard firmware onto it, and you can upload new programs again. The last step is to map the F13..F18 function keys to something useful on the computer. I do this in software instead of hardcoding it into sendKey so that I can easily change the keycodes without reflashing the device. I’m on Windows 7 for work and other reasons, so I use AutoHotkey to map the keys. For example, the following AutoHotkey code maps left and right to Page Up and Page Down, and the center to Alt-Tab. This is a great combination for, say, reading an e-book while eating noodles. On Linux, you can use Xmodmap or XBindKeys to remap your keys. For the Mac, KeyRemap4MacBook might work – haven’t tried it, though.